It hasn't rained here in Tel Aviv since sometime around March. Seriously, not a drop. It's not a drought; it's just how things work in this part of the world. 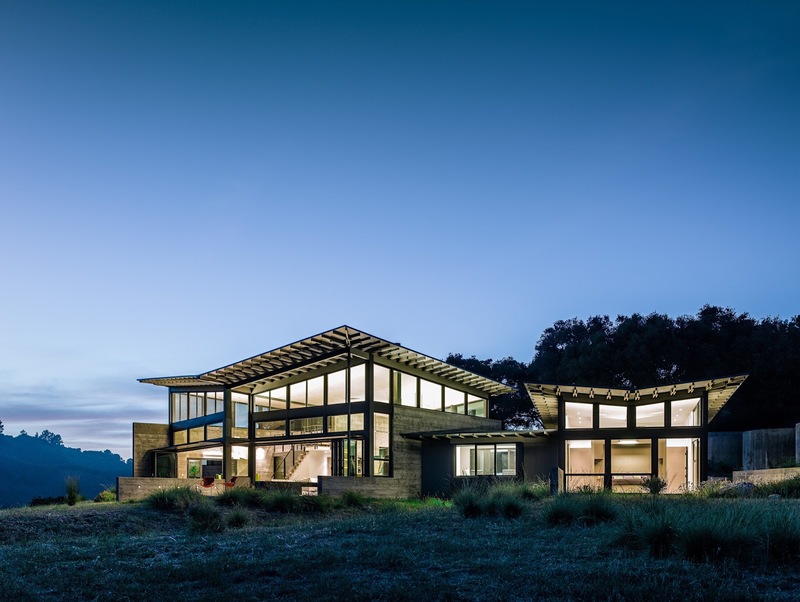 But in California, where droughts are now the norm, water preservation has become a key feature in architecture, and two homes on the Saint Lucia Preserve in Carmel have done an exquisite job of addressing the problem. Completed by Feldman Architecture in 2011 and 2012, respectively, the Caterpillar House and the Butterfly House are two representations of the same species—both custom-built, sustainable homes that harmonize with their natural and biodiverse surroundings. 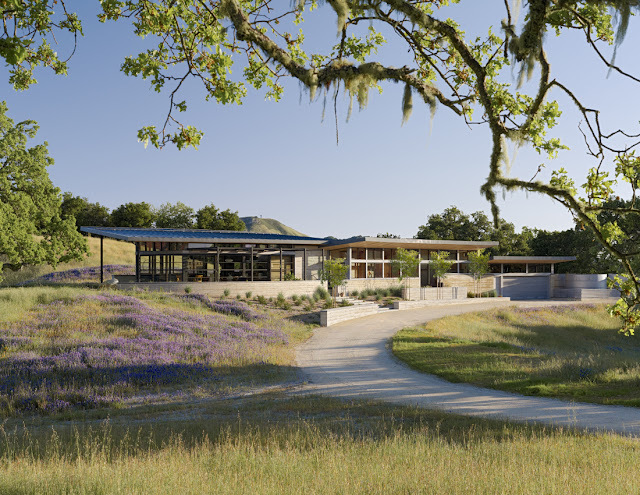 The homes are two of just 300 built on the preserve, which spans 20,000 acres. Let's work backwards from the Butterfly House's three separate pavilions. 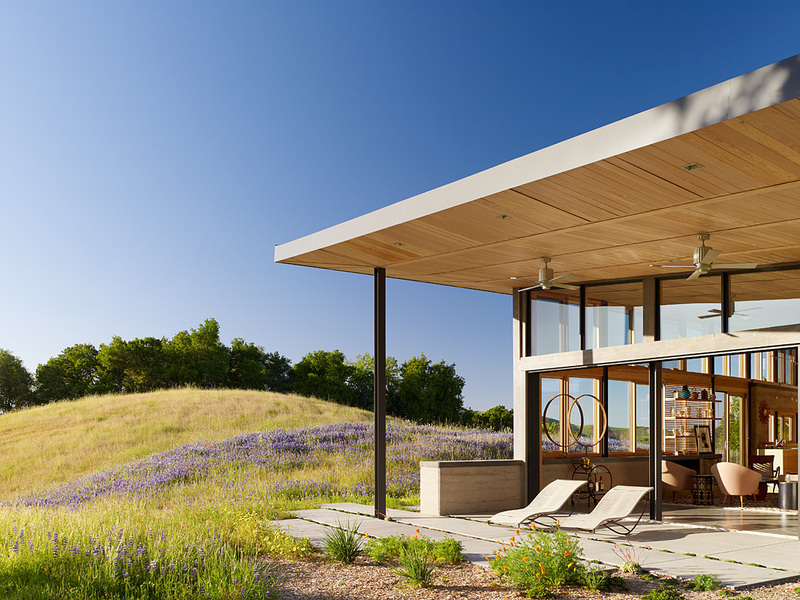 Topped by expressive roofs, the design is inspired by butterflies alighting on a meadow. 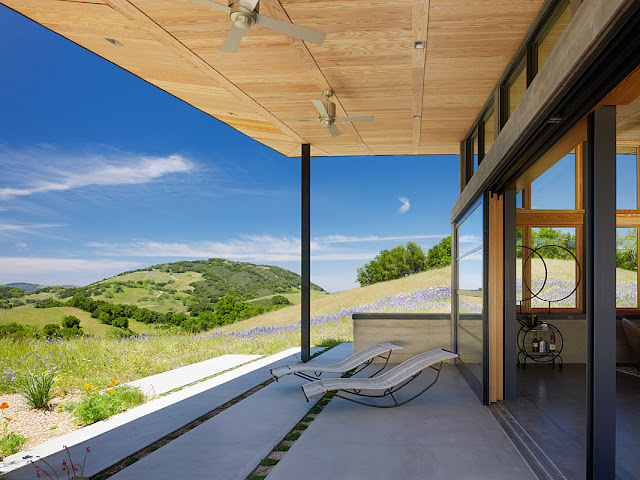 Beyond poetic gesture, the butterfly roofs bring in views of the surrounding hills, expand the main living spaces into the outdoors and also harvest rainwater. 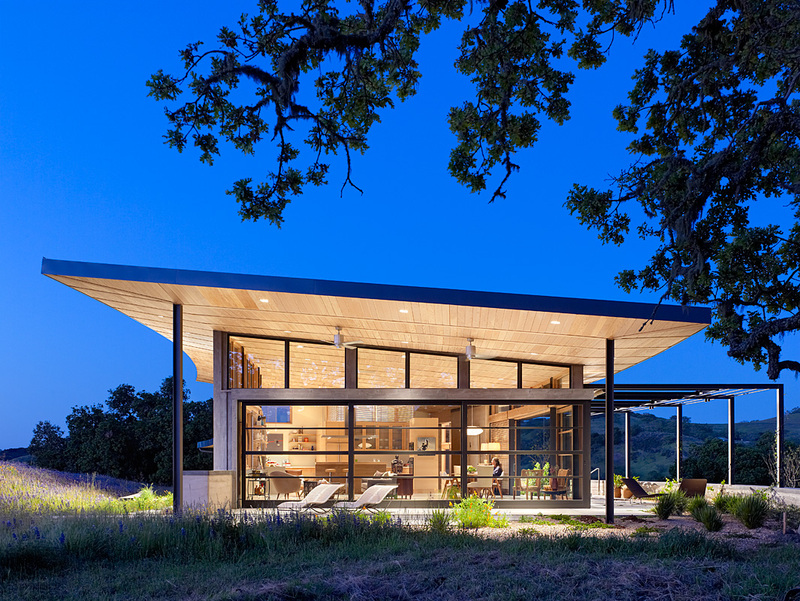 Water, an increasingly limited resource, is celebrated throughout the design. Each roof funnels water to a rain chain fountain and into landscape collection pools, which then gather in cisterns where it is stored and used to irrigate the landscape. 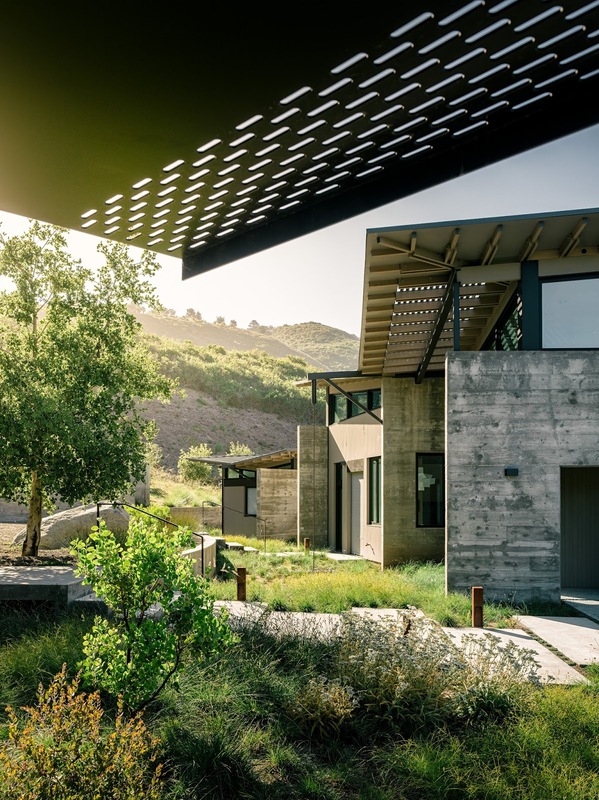 In addition, the pavilions were sited to allow storm water to flow under the office bridge during the rainy season and seep slowly into the ground in the main courtyard. 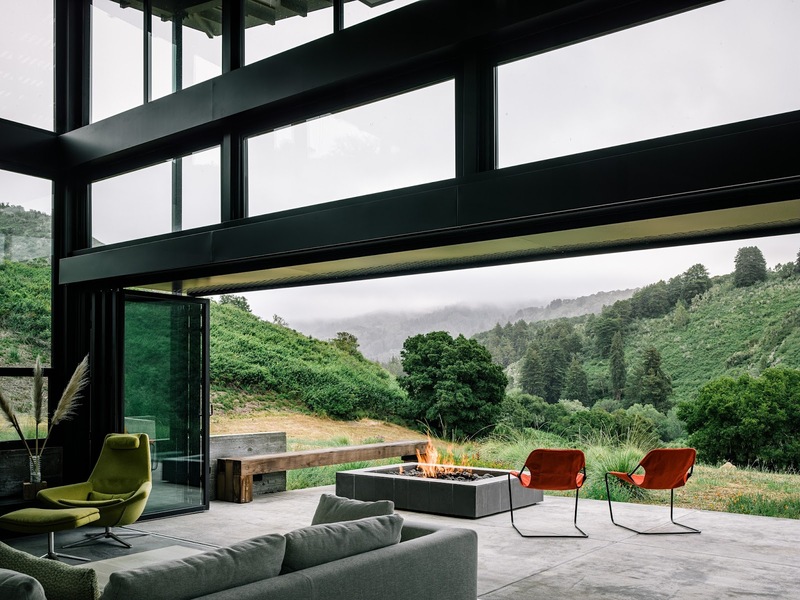 The neutral palette of the house—concrete floors and walls, large glass openings, plywood ceilings, and steel structure—flows from indoors to outdoors. 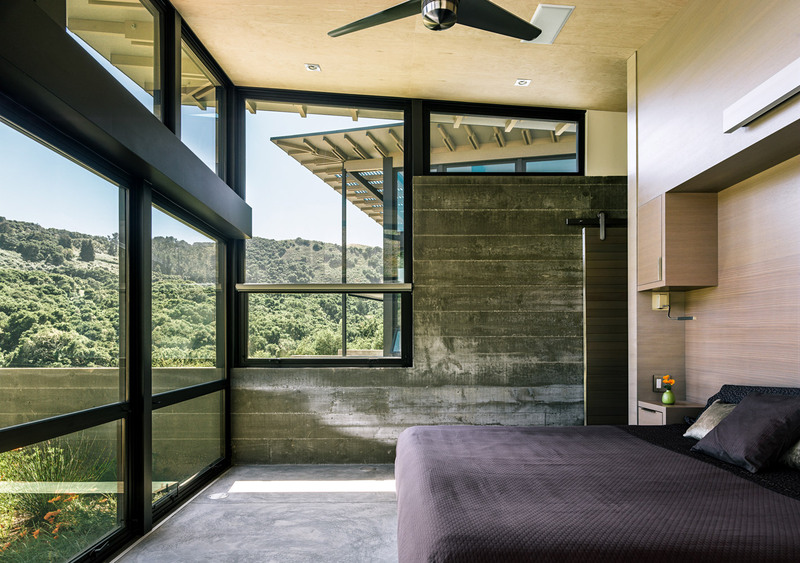 The use of concrete and large expanses of glass acts as a heat sink—absorbing heat from the sunlight all day and releasing that heat at night. 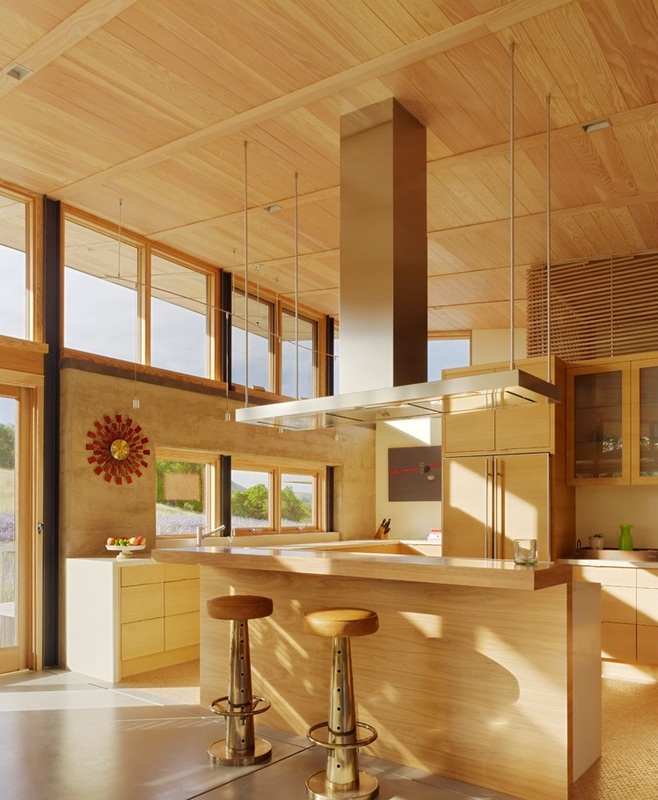 The house uses little energy as a result of extensive daylighting and passive thermal strategies. 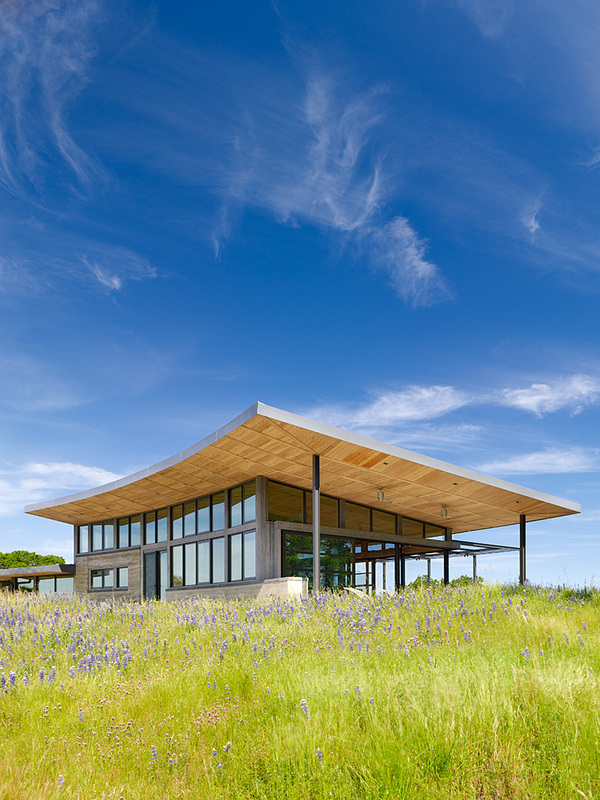 A large solar array located out-of-sight provides much of the energy that is used. 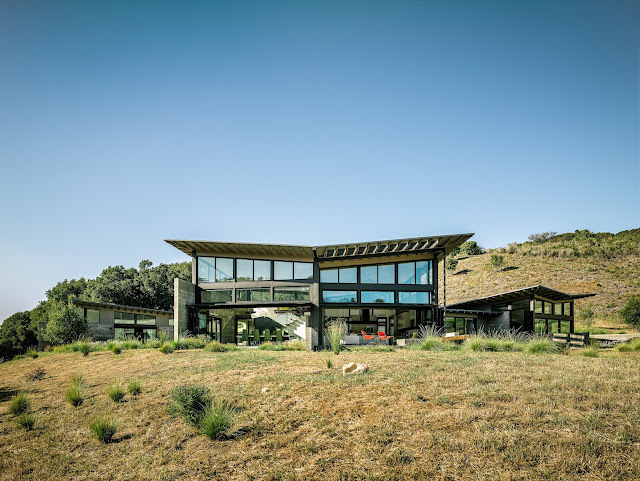 The Butterfly House's predecessor, the Catepillar House, was the first LEED Platinum Custom Home on California’s Central Coast. 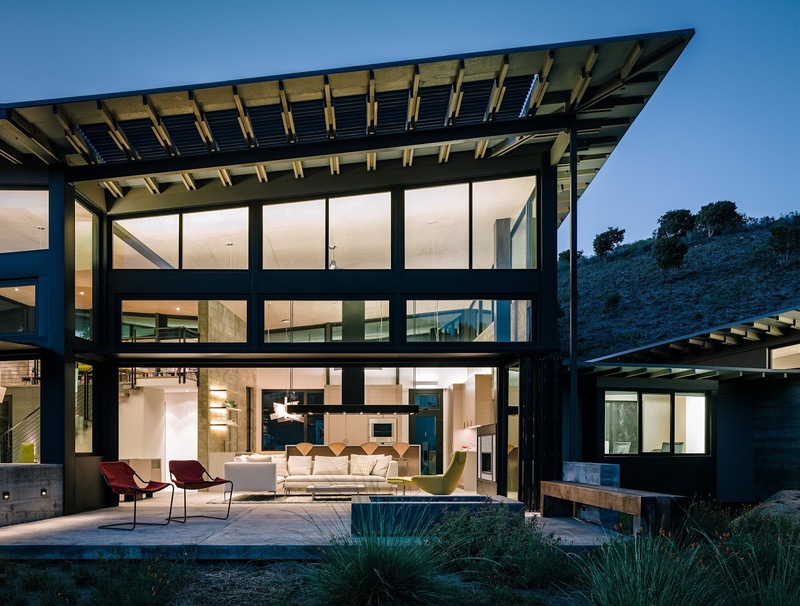 Built for a lover of modern ranches and the former resident of a Cliff May home, the Caterpillar House is built low and horizontal with an open plan, centering on the kitchen, that connects the indoors with the out. Connecting the home literally and figuratively to the site, excavated earth was repurposed for the construction of the walls. 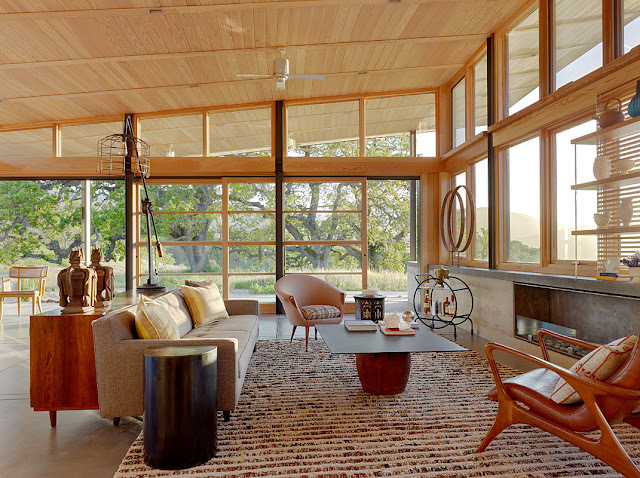 These rammed earth walls gently curve in response to the site’s contours and also act as a thermal mass, regulating temperatures from day to night. 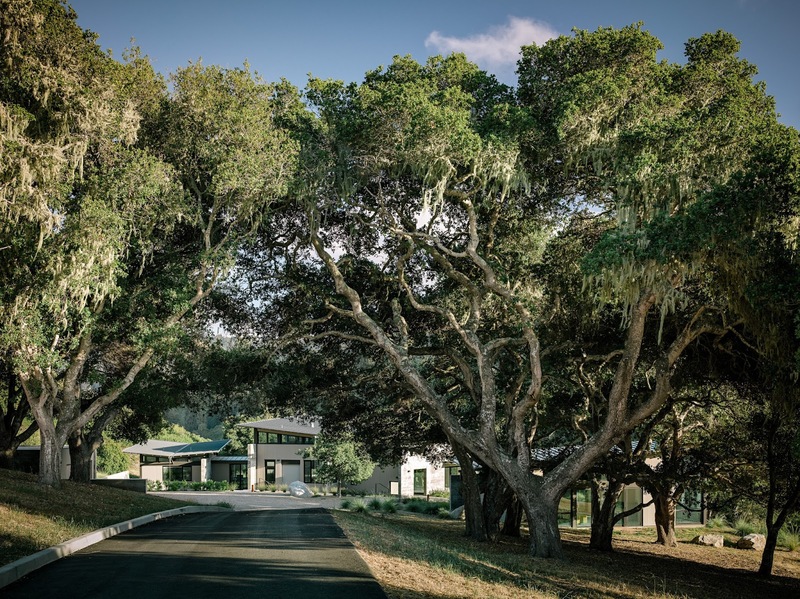 Three tanks close to the home proudly store rainwater and provide all of the property’s irrigation needs. 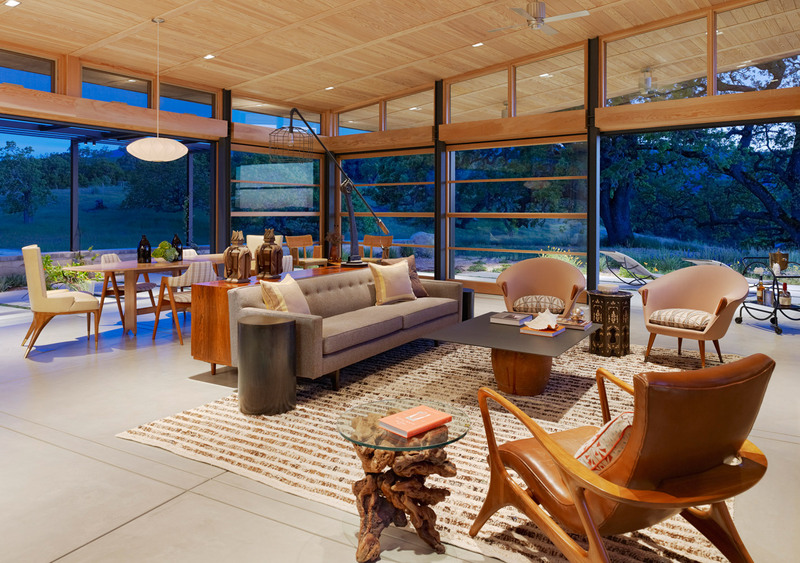 Large south-facing glass doors open the main living area to a large covered contemporary porch and to an outdoor patio with sunshades that expand and contract to allow for a flexible entertaining area that responds to the client’s needs. 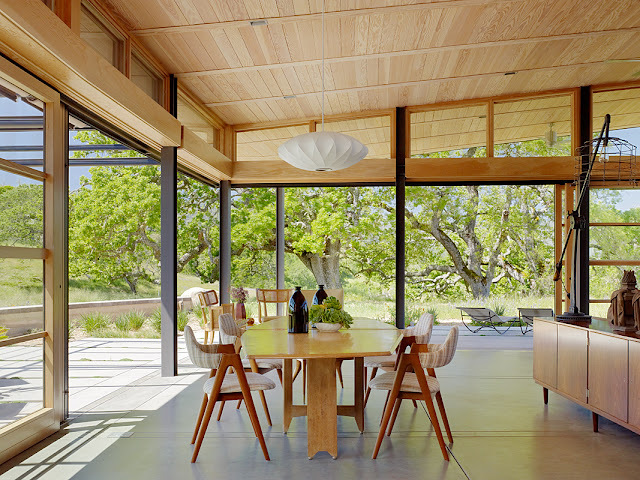 The glazing, natural ventilation and operable shading also act as a passive heating and cooling system. 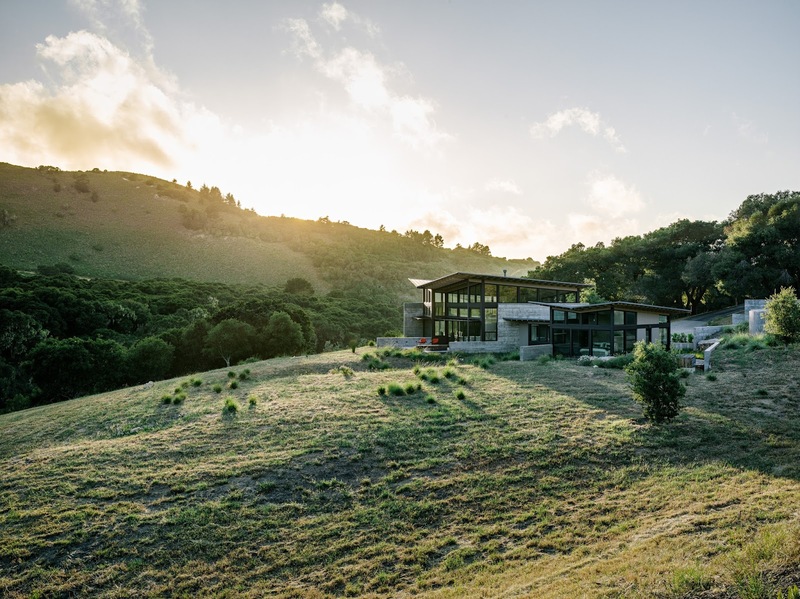 Integrated photovoltaic panels enable the house to produce all of its own energy requirements without compromising the graceful curve of the low roof against the hill. 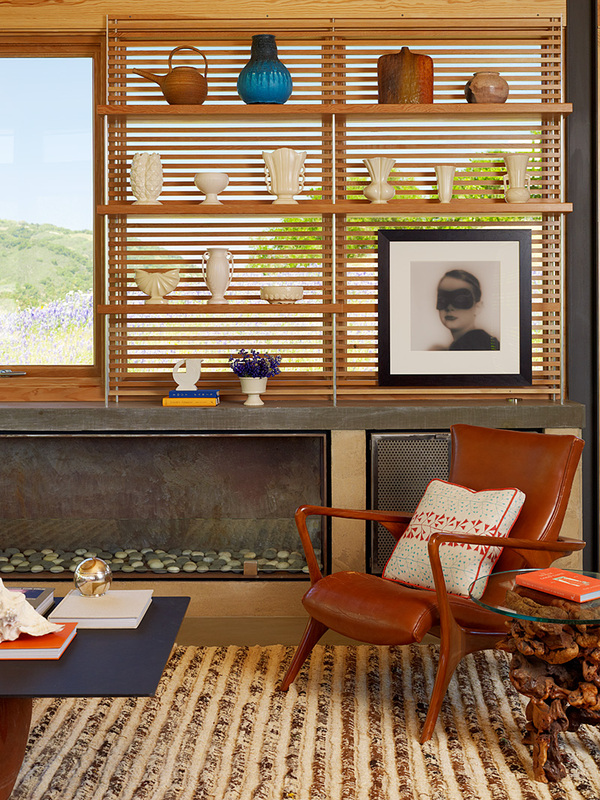 For more dreamy California modernist projects, visit Feldman Architecture's website.